Survivors and allies support Anneliese Harlander as she reads the letter she planned to present to Campus Provost/Executive Vice Chancellor Marlene Tromp. Photo by Lluvia Moreno. 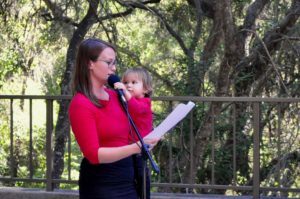 With her daughter rested on her hip, Anneliese Harlander, a survivor of sexual violence, read aloud a letter to a group of about 50 demonstrators at Kerr Hall on Oct 8. The letter she co-wrote with three other complainants demanded justice in the Gopal Balakrishnan Title IX case. The mix of students, survivors, professors and supporters listened intently to the letter, addressed to Campus Provost and Executive Vice Chancellor (CP/EVC) Marlene Tromp, preceding a meeting between Harlander and Tromp. The UC Santa Cruz Title IX Office found that Balakrishnan, a tenured history of consciousness professor, violated the university policy on sexual harassment. The disciplinary procedure for tenured faculty involved an opportunity for both Harlander and Balakrishnan to meet separately with Tromp by Oct. 9 before disciplinary action is proposed. It is unknown at time of press if Balakrishnan met with Tromp as well. 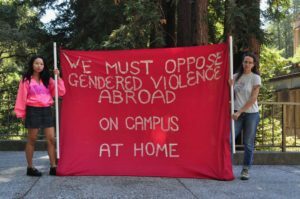 Balakrishnan is still employed by UCSC, receiving an annual salary of $110,300 as the university considers its next action. 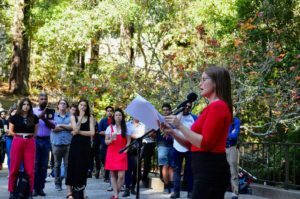 Harlander said the main point of her meeting with Tromp was to deliver the collective letter, the petition and her personal statement while also sharing her experience directly with the executive vice chancellor. Long before complainants filed formal accusations against Balakrishnan, there was an understanding between many of the graduate students that he was a possible threat. In November 2017, an anonymous letter was posted to Facebook that contained seven detailed allegations against Balakrishnan. The anonymous letter gave Harlander the motivation to speak out about her experience. Anneliese Harlander reads the letter she planned to present to Campus Provost/Executive Vice Chancellor Marlene Tromp while her daughter Luna looks on. Harlander cited her daughter as one of her main reasons for coming forward, because she was looking to set an example for her. Photo by Lluvia Moreno. The letter Harlander read to the crowd acknowledged the silent voices who remain unheard because they fear speaking or because of the lack of recognition that anonymous reports have received. It then laid out four complainants’ demands for action. The complainants’ letter insisted the university proceed with investigating remaining Faculty Code of Conduct complaints posed against Balakrishnan and demanded an expedited hearing in which Balakrishnan is terminated. It also asserted that the Humanities division issue a statement explaining how it will prevent the culture of permissibility that some say has become a norm, and that every member involved in the “literature faculty email thread,” which supported Balakrishnan and dismissed accusations, issue a formal apology. “Students who have been victims of sexual assault must not only deal with the traumatic pain and suffering that [Balakrishnan] has caused, but must struggle in an attempt to move forward and seek justice,” said Graduate Student Association President Randy Villegas to the crowd. A complaint shared among protesters was that Balakrishnan remains on payroll. Protestors felt that this action sent a message to students, survivors and supporters that they value staff more than the safety and comfort of students. Demonstrators calling for the UC to terminate Balakrishnan display a strong message for the university. Photo by Lluvia Moreno. As the meeting with Tromp commenced, support outside continued. Harlander requested one last moment of good thoughts and prayers before heading into Kerr Hall. Afterward, students, faculty and supporters came up to the microphone to share stories and support. The day after the meeting, Harlander was optimistic but she made it clear that they would continue to put pressure on the university.